Packaged broccoli slaw is a healthy convenience food. Packed with fiber and vitamins, it can be used instead of cabbage to make a great slaw or tossed into green salads for added crunch. But did you know you can cook it? You can, and it makes the fastest stir-fry you’ve ever had. 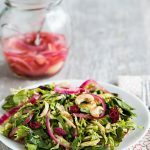 Broccoli slaw is simply peeled and shredded broccoli stems combined with a little shredded carrot and sometimes red cabbage. You can make it yourself with a food processor or mandolin, and that’s a great way to use leftover broccoli stems, but peeling and shredding does take a little time. Honestly, I never bother. I save my broccoli stems for other uses and keep a package of organic broccoli slaw in my fridge to add to my daily salads. Recently, I somehow wound up with two bags. 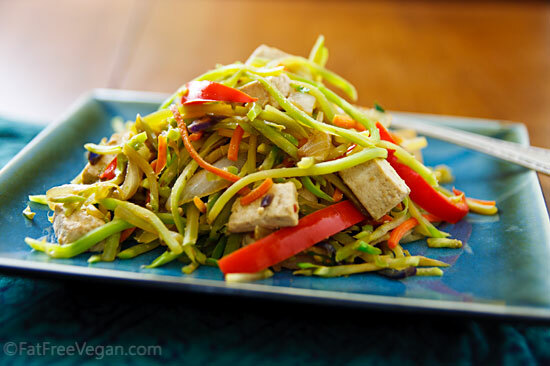 The one bad thing about packaged broccoli slaw is that it goes bad quickly and odoriferously, so to make sure that none went to waste, I used one package as the base for this Ridiculously Easy stir-fry. Because the broccoli stems are so thinly shredded, they cook in about two minutes, allowing me plenty of time to brown a little tofu to make this a filling main dish. 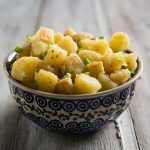 It was so tasty that it was an instant hit with my family and, because it was so quick and easy to make, I’ve added it to my short list of “last minute meals” that I can throw together in minutes. This is a “dry” stir-fry that doesn’t have much sauce, so it’s best served over seasoned rice or pasta. If you have all your ingredients and cookware prepared, you can have it on the table in about 20 minutes. Combine the tofu, sliced garlic, rice wine, and 2 tablespoons soy sauce in a gallon-sized ziplock bag. Seal bag and turn gently to coat the tofu with the marinade. (You can also do this in a large bowl, carefully stirring the tofu to coat.) Set aside as you chop the vegetables and heat the skillet. Begin heating a large, non-stick skillet or wok over medium-high heat (make sure you have a lid for this pan nearby). While the pan is heating, remove the root and stem ends from the onion, cut it in half top to bottom, and cut each half into thin vertical slices. Slice the bell pepper thinly, and mince the garlic and ginger. When the pan is hot, drain the tofu, keeping the marinade in a large bowl. Place the tofu in the skillet and cook, turning every minute or so, until it’s beginning to brown on most sides, about 6 minutes. Transfer the tofu to the large bowl with the marinade, stir gently, and cover with a plate. Add the onion to the hot pan and cook for about 2 minutes. Add the bell pepper, garlic, ginger, and pepper flakes and cook for another minute. Add the broccoli slaw and two tablespoons of water and cover quickly. Steam for 2-3 minutes or until slaw is slightly tender but still crisp. Add the tofu and marinade to the skillet along with the sesame oil and additional soy sauce, and stir well. Heat for just a minute or two and serve immediately. I hope you enjoy this quick, easy, and delicious recipe as much as my family did! Stay tuned for more “Weekend Quickies”–ridiculously easy recipes using nutritious packaged foods and natural ingredients. Hoo boy, you’ve really given me a craving for some broccoli! Love this! I totally need more healthy stir fry’s in my life! 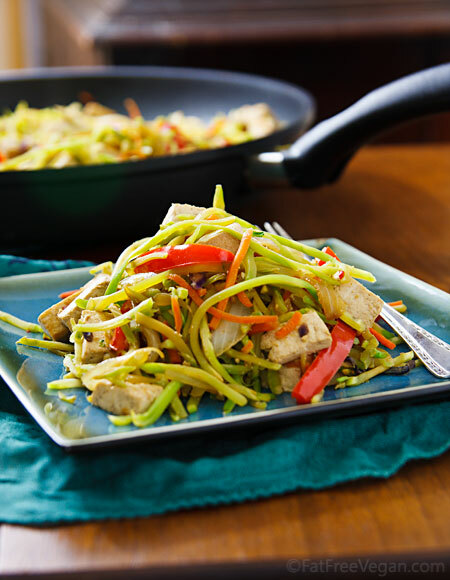 What a great take on stir fry! Looks great! 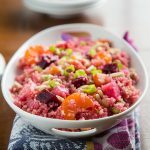 Thanks–what a yummy easy way to use broccoli slaw! For a soy free alternative, I think I might experiment with marinating some portobello slices in the marinade. Or maybe cooked chickpeas. Hmmm. Something to think about. 🙂 Great photos. I enjoy your beautiful blog so much, Susan! My family has been mostly vegan for over a year now– since dh’s scare and stent. It was a blessing that caused us to get serious about our health. Are you less inclined to use soy than in the past? What’s your opinion on that? Also, do you order food products online? I’m very sad that the Sunflower market near me closed. I have not found a store that carries farrow. recommendations? I do a similar quick and easy stir-fry with packaged broccoli and coleslaw and eat it with a tortilla and hoisin or plum sauce as a nod to moo-shoo. Yumm! Hi! We’re a couple of Italian vegan foodbloggers. We’ve just discovered your blogamazing … We’ll try some recipes as soon as possible! Thanks a lot for sharing them with us :-). This tofu recipe must be delicious! Susan — This was SUPER EASY and REALLY DELICIOUS! Thanks for a great idea. I made it even faster/easier with a bag of frozen tri-color bell peppers and onions. With food this good and fast, who would even think of going to a fast food restaurant!? Happy Monday! I have Mirin in the pantry – would that be suitable for rice wine? It’s a sweeter and less salty, but I think it would still taste good. 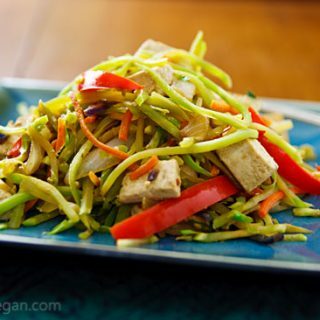 I stir fry broccoli slaw all the time, with tofu or seitan. Have you tried rainbow slaw? It has some red cabbage added in. Broccoli slaw is my new power food! I have been eating it for a couple of weeks and I eat it both raw and cooked. Last night I chopped some up and mixed it with marinated tempeh to stuff in a bell pepper. It was amazing! I can’t wait to try this stir fry. I’ll be food shopping tomorrow with copy of recipe in hand…thanks always for the great visuals. I enjoyed this but ran into a question. I didn’t see when to add the red pepper flakes so I sprinkled them in with the broccoli slaw. Also I only had sherry so I added some rice vinegar for a little zing. Overall a good quick recipe. 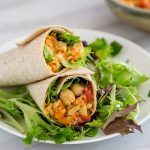 Thanks for all the work you have put in to this blog it has made my families vegan transition much easier. Sorry about that! I meant for the pepper flakes to be added with the ginger, but somehow they were left out. I’ve added them to the instructions. Thanks for letting me know, and I’m glad you enjoyed it. I tried this recipe because I wanted to try using the broccoli slaw and because it seemed really easy. (It was!) Because it was so simple and had simple seasonings I expected it to be one of those recipes that I enjoy but don’t think about much. But the next day I found myself thinking over and over again about the crunch of that broccoli and really looking forward to having the leftovers! Plus the portions are huge! I think this will become a regular, and I’m looking forward to trying the variations others have suggested! Thanks! You are great! I’ll be making this after your lentil soup! I’ve enjoyed following your blog, admiring the photography and making your delicious recipes for several years! Now I do have a question. How do you prep the tofu? Just drain and rinse it or do you press it to remove more of the water? Also, do you have a suggestion for “seasoned rice”? Its good for my breakfast.tasty & less time consuming. I love broccoli slaw. I use it in my salads instead of florets. A real time saver. Also, my carnivore husband put it in lasagna. Of course I had to try it in my vegan version. FABULOUS! Not everyone cared for it. I think it was they weren’t use to the texture and not really the taste. Anyway, we love it. Thanks for an extra use. I love this recipe, but my tofu doesn’t really “brown.” Is it supposed to? How do I know when it’s ready?